Do you create websites for clients who subsequently manage website content themselves? As a web agency, freelancer or webmaster, are you constantly fighting for having the nice look of the website you’ve built preserved during its lifetime? Each website “developer” encountered a situation that after a few months following the difficult job of personalizing the theme to your client’s expectations, the website no longer had all the aspects of a professional-looking presentation. Is it even possible to use the WordPress platform for content editing by a non-technical user? 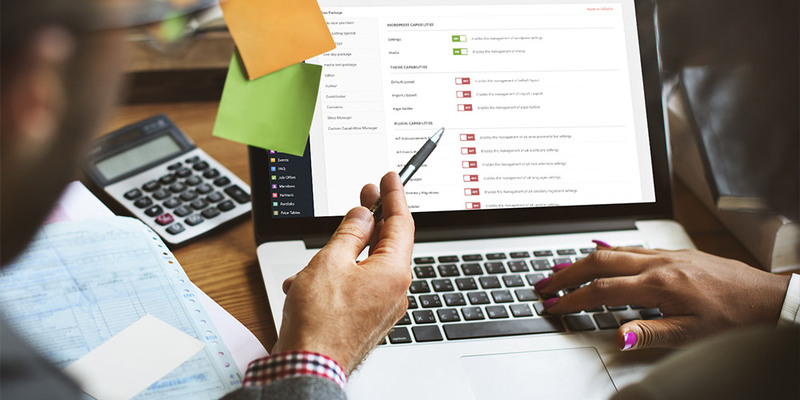 The main idea of ​​CMS is that the website content management task belongs to the owner, copywriter, or marketer who independently accesses the administration interface. Adding a new text, image, or update of the price table does not need to be performed by the website “developer” itself. 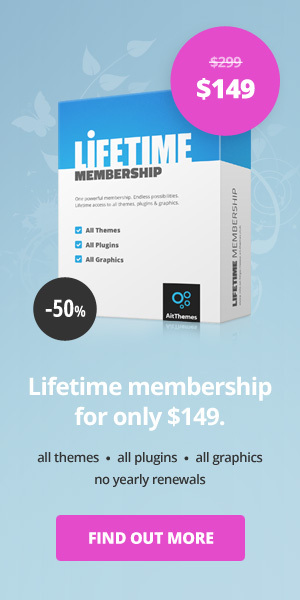 Our priority are time-saving features that truly help you with your work with WordPress theme. WordPress itself provides certain basic permissions settings, but it is not possible to set up separate permissions for specific website types. AIT Permissions Manager is an extended permission plugin that enables website admin to set up WordPress user roles as required. This means that web admin can set up separate permissions (individual for each user) to the Theme, Custom Post types and even plugins. How many times were you in the situation when non-technical clients approached you with the request to rescue their website? In case the client has access to the Theme Options, Page Builder and any other settings enabled in permissions settings, client can unintentionally make setup changes that can cause various issues. Because of this, the website can start malfunctioning and additional resources need to be allocated by the web agency for restoring the website back to its original state. Fixing of issues created by clients is often much more time consuming than it seems at the first glance. In addition, there is a business dilemma in relation to the client – should the costs for a website repair be invoiced to the client? Or should the costs be rather absorbed internally? Permissions Manager plugin enables web admin to make available only those parts of admin interface to the client that client really needs for managing the website content. By assigning the right capabilities of WordPress roles, you save client’s time as the client doesn’t need to worry about finding the right settings among all the Theme Options. You simply deactivate what client doesn’t need. Furthermore, you can provide your client with the user-friendly interface of wp-admin itself via Easy Admin plugin that simplifies the website administration and provides better experience to your client. Most of the web agencies cooperate with various external service providers, e.g. copywriters or translators. Permissions Manager is a very useful tool for this – you can assign the Editor status to these users and give them permissions related to Posts only. Thanks to these permission settings, editors can access the admin without interfering with other parts of the website. Another advantage is that they can add content directly via admin interface and do not have to send it to you via text files. This means that you do not have to copy individual posts or translations into admin and perform any other additional work. Plugin Permissions Manager brings the approach how to change permissions to the next level. This plugin makes the management of capabilities of WordPress roles more efficient. AIT Permissions Manager allows the agency to create business model variations by locking access to certain wp-admin parts or plugins. On one side, clients won’t break anything and on the other side you can charge a fee for making setup changes, installing updates or activating WordPress plugins. AIT Permissions Manager is fully compatible with AIT Translated & Multilingual Themes, including Directory & listings Themes. Also Easy Admin plugin can be used for all the previously mentioned themes that are developed by AIT. Our permissions plugin is not only our competitive advantage. It’s mainly yours. Better user permissions management makes the work with client website more efficient. Thanks to Permissions Manager plugin, you can assign individual permissions to the selected users and disable access to certain parts of the website. By this you can avoid the unintentional unqualified interventions to the website that can cause website malfunctioning. Furthermore, this plugin can save you lot of time you would spend on rescuing the website, recovering it to its original state or copying the translated content from translators into the admin interface. 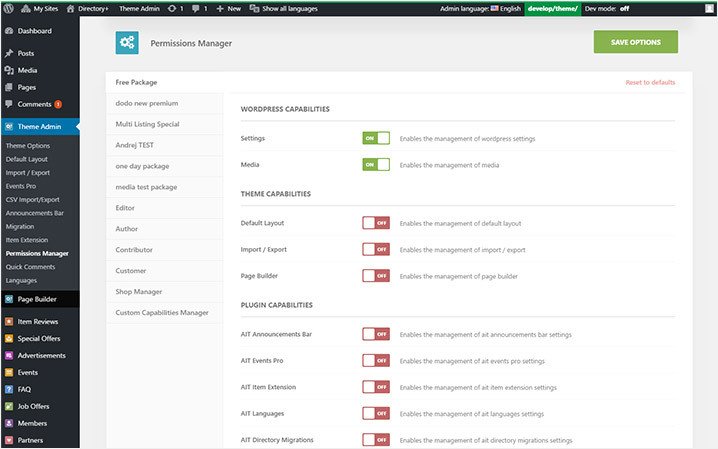 AIT Permissions Manager plugin improves the way how to change permissions of WordPress roles. What is your experience? Leave us a comment below. That is exactly what we’re dealing with all the time – customers have access to all theme features and we don’t want that. I’ll test the plugin today, hope it’ll solve our issues..
thansk for asking. 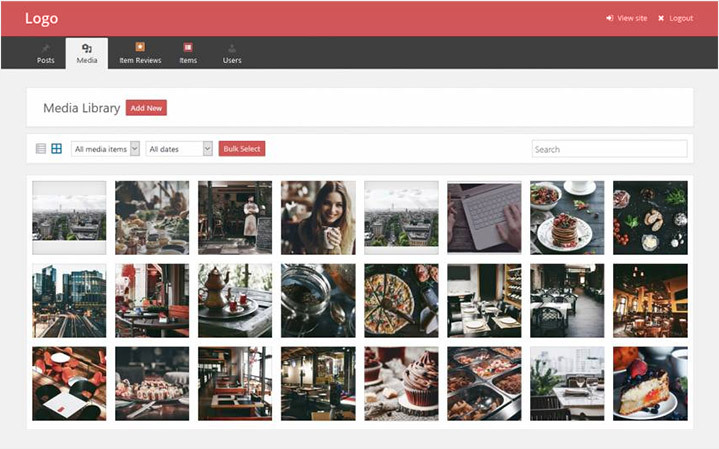 Theme uses Search Form element: https://www.ait-themes.club/doc/search-form-element/ thanks to which you can search for the Keywords used in Title, Description and/or in the Content of Items custom post types. It search also for a location and/or for category. In case of order the brick theme, will we get a ready to use homepage? Hello, Could you tell me where can I find information about how to allow some user to access different kind of pages based on their permissions.